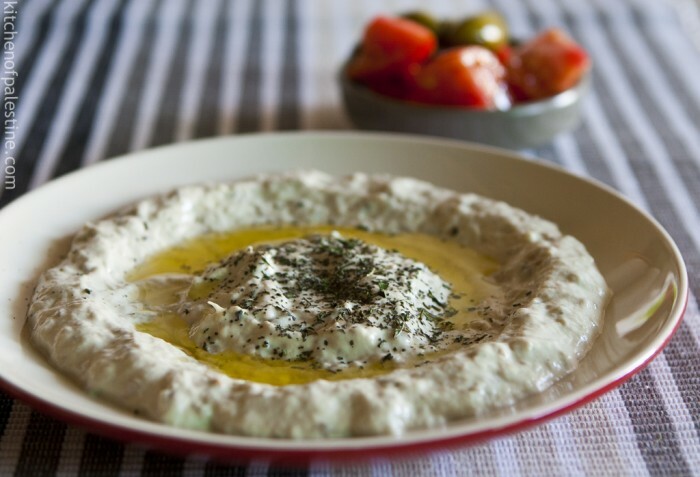 Mutabbal (or Mtabbal) is not only one of hundreds Levantine appetizers (mazze), it is the most popular one (beside hummus of course). 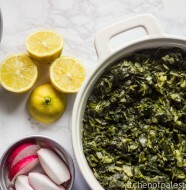 The origin of the word Mutabbal is Arabic tabala, literally meaning ‘to add additional flavors and spices’. 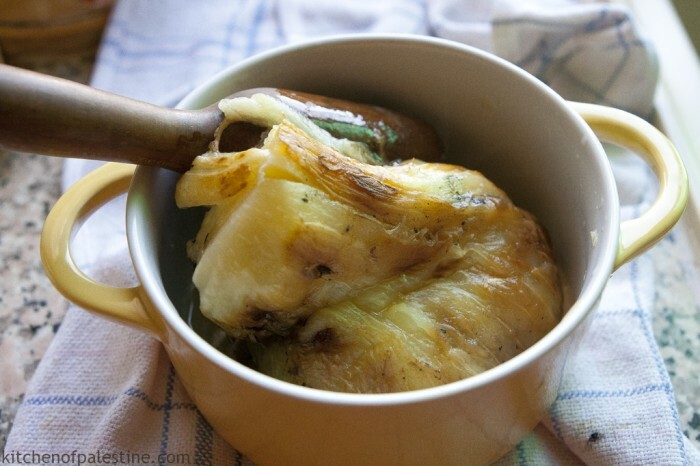 It is made of two main basic ingredients, eggplants and tahini. This classic combination always works. But what makes your mutabbal stands out is how you cook the eggplant! 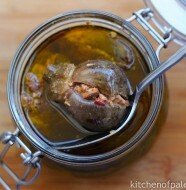 There are few ways to cook eggplant for making mutabbal. Some would deep fry it, while others would bake it in the oven. But nothing could beat the unique taste coming from roasting it. 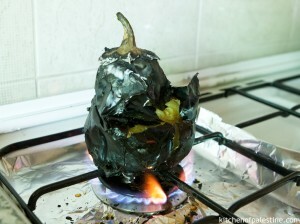 Roasting eggplants on stove-top or barbeque grill brings out richness in eggplant and adds smoky flavor and aroma to the dish. About picking the good eggplants for making mutabbal, I quote Christiane Nasser: “Large and pulpy Jericho eggplants (betinjan rihawi) are ideal or frying and grilling. They are quite sharp when grilled, and intensify the flavor of many salads that accompany meat dishes”. 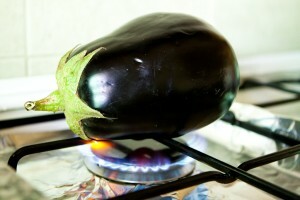 Place the eggplant as is (without peeling) directly on the stove-top over a medium heat. Leave it roasting and keep turning from side to side until the skin is blackened and pulp is soft and tender. This process takes about 15 minutes in total. 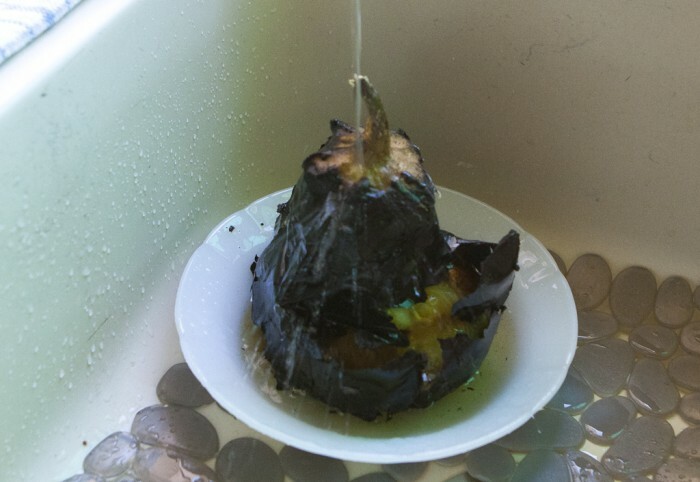 Peel the eggplant under running cold water in order to remove the skin easily. Trim the stem off from the eggplant and remove the seeds (if any). Put the eggplant in a pot. Mash it with a fork or a hammer. Add garlic, salt, tahini, lemon, and half cup of water. Mix all ingredients together until well combined. Taste to adjust salt and lemon. Spread the dip in serving plate, drizzle with olive oil and garnish with a pinch of crushed dried mint. Serve warm or cold with pita or taboun bread. 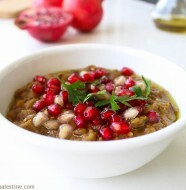 22 Comments on "Eggplant Dip (Mutabbal)"
Thanks, can anyone explain the difference between this and Baba Ghannouch? This question is being asked quite a lot. I used to confuse between them as many people think that they are the same dish, but they are not. 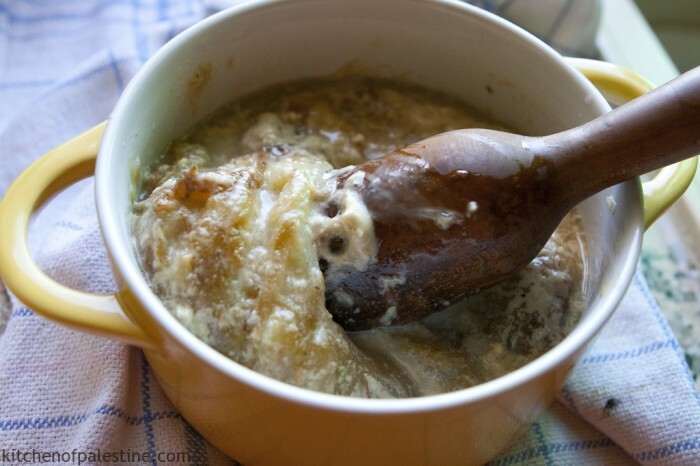 Both M’tabbal and Baba Ganouj share the same main ingredient which is mashed roasted eggplant. For M’tabbal, it’s mixed with tahini, garlic, lemon juice, and sometimes yogurt. While for Baba Ganoug, it’s mixed with tomato, green pepper, walnuts (more of a salad). Actually, m’tabbal sounds a lot like the Greek melitzanosalata. Which I definitely love. Just found this site and it looks great. I look forward to trying your recipes. Thanks for sharing them. Looks really tasty. What can I do if I only have an electric stove (no open fire)? You can bake it in the oven. Make some holes in the eggplant with a fork or a toothpick. Then wrap it with foil and bake it in the oven for 45 to 50 minutes. Or you can put it on the grill for the smoky flavor. I am so glad you are back. Amazing Blog! And I’m really glad that I got the chance to find your new wonderful blog. Thanks for the wonderful recipe!!! Thank you so much i have been looking for a good recipe. I would like to know the serving size? Thank you Alia. Mutabbal is usually served in a plate or two among other food options (as appetizers). did you hard boil it first!? Finally i found it, amazing blog! Now i can cook arabic food for my Madame and baba. Thank you soooooooóo much…! Bless you! This is an Israeli dish. Shame on u for stealing it. Haha just kidding. I love Pal food. So delicious and nutritious. I am not an Arab but I have spent most of my childhood in Arabian countries . I have lived with them ,dined with them . They have always been respectful, courteous and hospitable .I simply love their food . I was looking for authentic Arabian food and stumbled upon this blog. Thanks a lot for the recipe and the pictures are quite helpful..way to go!!!! !